Ugh, Last Wednesday’s strip isn’t 100% done. The panel of Krep is a busy one. Almost done though. Of course, part of the problem is I went out with some friends to do some plein air* painting for a good portion of Monday. * “plein air” is French, meaning “in the open air.” It just an expression artists use to say they painted outside. A little froofy perhaps, but there it is. Apparently “peinture sur le motif” or “painting on the ground” is variant. 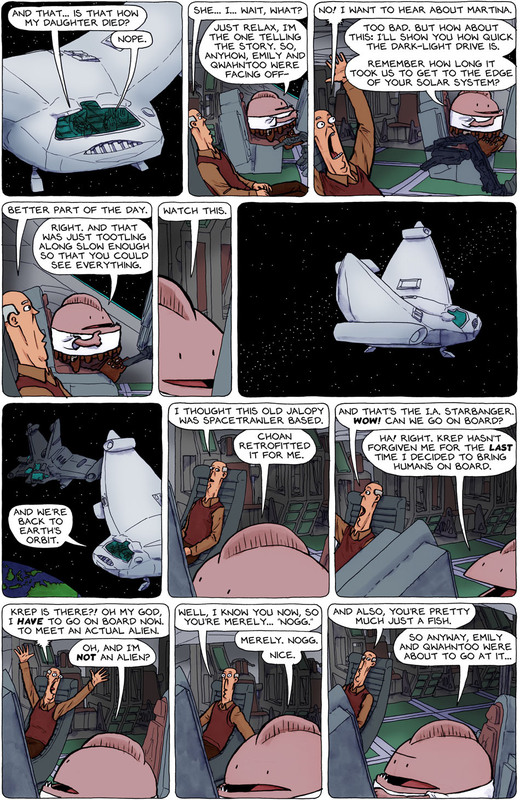 Thank You for SpaceTrawler and the smile it puts on my face every night. I hope you thoroughly enjoyed your day out in the “plain” air. I am always amazed at the complex detail in each strip. The uncolored strips give me a much greater appreciation of all the detail you put into your work. That painting deserves an applause! And does that last panel indicate Jim Anderson’s guest strip is now canon? Nogg deserves that “Pretty much just a fish” comment for switching topics! When I was on the wrestling team in high school, anyone who was easy to defeat was called a fish because they just flopped around. Not sure if that’s relevant, but I felt the need to chime in… Also I’m glad that we are not too close to the end of the story yet. Krep is definitely my favorite crewmember. I love that painting! Beautiful! That painting really is amazing. Can you post a more detailed picture of it? @Rafi, sure. Here you go. He’s easily one of my favourite characters. Kinda like how Wilf is easily my favourite companion of The Doctor. It’s only froofy if you’re not French! By the way, am I missing something? What panel with Krep? So basically you draw a strip about changing the scene from one cliffhanger to another and simultaneously (and cleverly) postpone an update on BOTH cliffhangers. And by the way, Krep is pretty much just a squid. With one eye. Okay, and hooves. Crap, never mind. @Christopher, I really like your painting, the way the path just goes into the field and then stops. It reminds me very much of Van Gogh’s “Wheat Field With Crows”, but in a much cheerier perspective. @Muzhik. Thank you! Some have an ear for music, some for a cheery perspective. He had no ear at all. @Muzhik, stops? It keeps going in the distance all the way up to the forest. and thanks for chiming in, Jim! @Evil, No; if you look closely at both the painting and the photo you’ll see the area of flattened grass ends just before the shade of the lone tree in the painting where the grass is taller. It’s a farm field turnabout, just like the ones in the old Iowa farms where I grew up. So… if we, your audience, can keep you engaged with richly filling out storyline nuance, said story will go on longer? What’s the little black thing in the painting by the shed that isn’t in the photo? @TB, A tire. Actually, a whole axle and that was one of the wheels. I decided not to put it in. Well he certainly has acclimated to the new way of seeing things in a wider world. Our strength is in adaption. Love the painting Christopher! makes me want to crack out the Brushes. 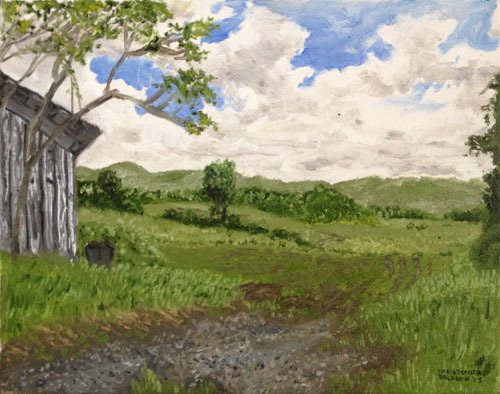 I would love to see you return to the spot in the fall and paint the same scene!